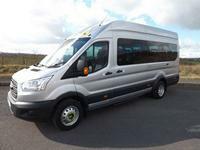 GVW is 4600kgs, so will require a D1 licence to drive this Minibus, should you require a Minibus to Lease that can be driven on a car licence, we have a range of 17 seat CanDrive Minibuses that do not require a D1 licence. The Ford Transit base vehicle is provided with a 3 year Ford warranty and the conversion with a 3 year Minibus World warranty. It features 9 removable seats and 6 fixed seats giving the following configurations. Available in white or silver and basic or trend model. Signwriting available. NB: Photos used are for illustrative purposes only and may not reflect the full specification of the advertised vehicle.